Aarikka design was influenced by the manuscripts of Pauliina Aarikka, the daughter of company founder, Kaija Aarikka. Aarikka The design is characterized by its clear, Scandinavian lines, rounded shapes and the wood. In the past five decades has Aarikka employs not only its own designers, but also leading Finnish designers have Aarikka, worked as Aino Helsinki Favén, Jorma Vennola, Jukka Rintala, Tuula Falck, Markku Salo, Paola Suhonen, Anna Ruohonen, Anu Leinonen job Kalle Kuusela, Elina Helenius, Kaisli Kiuru, Saija Malila and Eero Sairanen. Each designer has the Aarikka design and refined to what it now so unique. Special feature: The Tonttus (elves) of Aarikka have cult status even among the international fans. 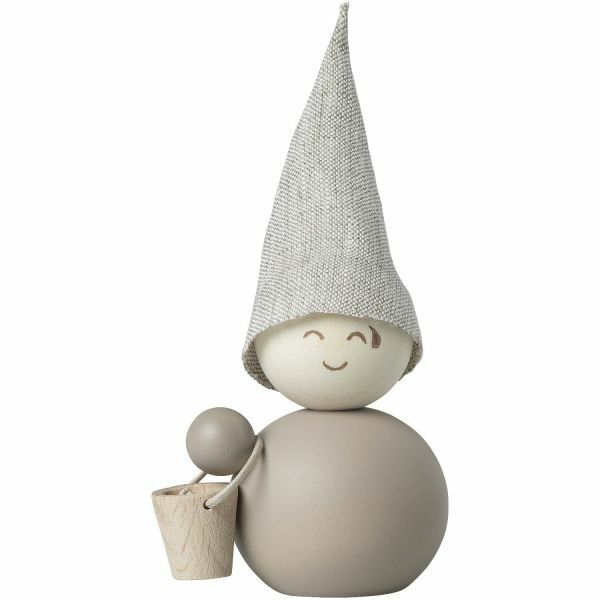 Since 2019, the wood specialist from Helsinki has been offering the little protectors as a decoration for the sauna. Of course, the pretty figure is decorated with a typical accessory from this kind of wellness. Feature: This nice figure is made by hand in sheltered workshops. Scandinavia Tip: Sauna is the only Finnish word used in almost every language in the world. Customer evaluation for "Aarikka Saunatonttu w. bucket"